Many of you have requested information on women’s fashion and details for a Winter outfits for women over 50. 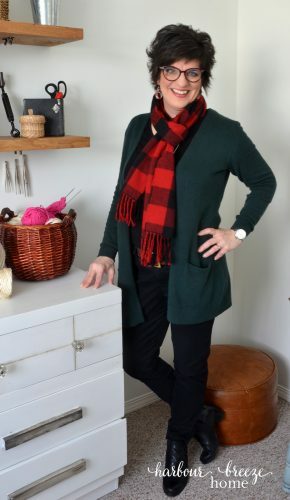 I’ve had great fun putting together seasonal wardrobes that mix and match and make me feel comfortable and pretty. My 10 piece Summer wardrobe can be found here. 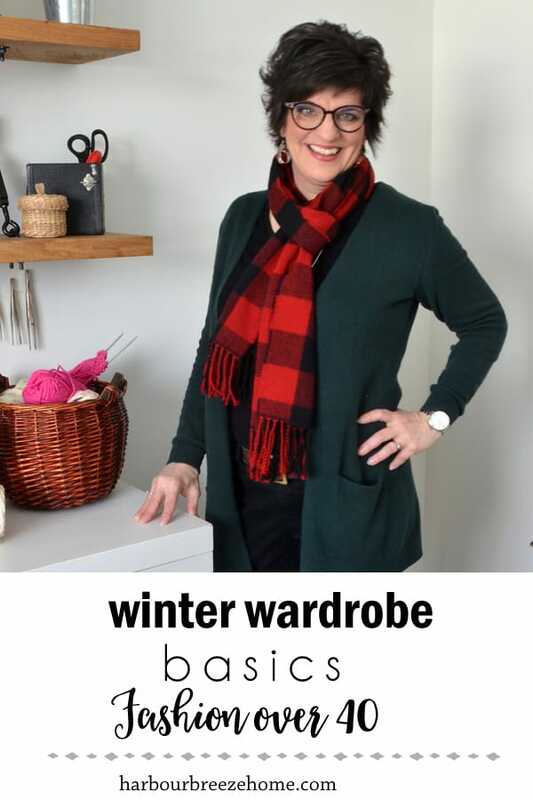 Today, I wanted to share with you some of my favorite Winter Wardrobe Basics that I think are worth investing in. My Grandma told me years ago to take good care of my feet, and when I became an old woman, I’d be grateful. I’ve been heeding her advice! Skrimping and saving by buying ill-fitting shoes is a bad idea over the long run. I invested in a low-heeled pair of Naturalizer ankle boots years ago, and wear them all Winter long! Mine are black, but I think the brown ones are really cute, too. Since I work a few days a week at a jewelry store, I like to have 2 pairs of dressier pants. Mine happen to be navy blue and black, but any neutral color you like would work great. They can be paired with nice tops and sweaters and can be a part of many outfits. I recently discovered these super comfortable Pixie ankle pants from Old Navy that quickly have become a favourite. Since I’m 5 foot 2, they come right to the top of my ankle boots. If you’re taller, they may fall higher up your leg. I love how they can be dressed up or down depending on the occasion. Last year I invested in 2 colors of open front sweaters. (The actual one I bought is this one. Unfortunately, I don’t see the colors I bought.) Open front sweaters can be paired with short or long sleeved t-shirts for layering. Add a long necklace or scarf and an outfit comes together in no time! Layering t-shirts in basic colors are a winter wardrobe must for me. I like this classic short sleeved one in black. But, I also reach for a long sleeved black tshirt or a fun striped one like this, too. I wear jeans almost every day in life! Finding a good fitting pair of jeans that makes you feel like a million bucks is very important! The ones pictured above are Old Navy Rockstar jeans mid-rise. They are a tighter fitting style in the legs. (I’m 5 foot 2 and wearing size 4 Regular.) Be sure to try out jeans until you find a pair that is perfect for you. 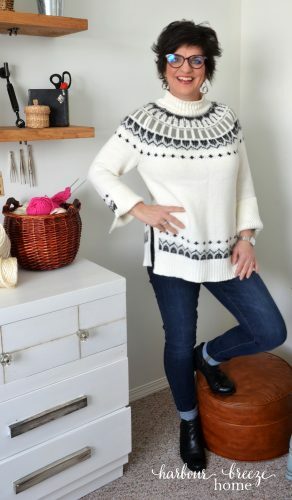 I got a Fairisle sweater earlier this Winter, and reach for it at least once a week. It is warm, and I love it’s happy print. Here is a similar one. 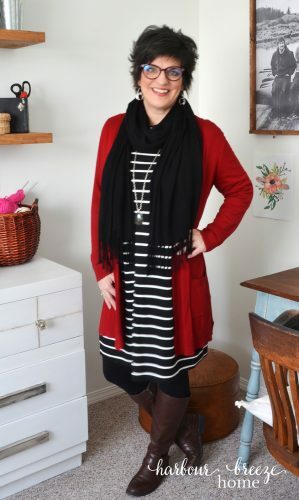 A striped dress like this is so versatile and comfortable! It can be paired with one of your open front cardigans, a denim jacket, or just worn alone. The right accessories can take an outfit up a notch and make everything come together! I love long neckaces and wear them a lot. Here’s one similar to one I have. Earrings, too, can brighten up your face and add a sparkle to your look. Here is a nice pair of classic earrings that would go with everything! I’ve started wearing camisoles under my shirts to smooth out my skin ~ but no tight fitting spanx for this girl! I prefer something more like this. I have them in a few different colors, but in Winter time, I reach for my black one most of the time. No matter what the season, nice underwear should be a part of your wardrobe. Throw out all those ratty things you’ve had and treat yourself to some special pretties. Soma has become my favorite brand, and these just might be the most comfortable underwear I’ve ever worn. They come in a whole variety of colors and styles. I’ll hunt up where in Canada I can purchase them. The open sweater looks soft and great too!